St. Bernardus | Beer Apprentice - Craft Beer News, Reviews, Interviews and Info. For today’s craft beer review I’m going to be trying the St. Bernardus Tripel produced by the Brouwerij St. Bernardus NV located in Watou, Belgium. I hear this brew goes well with turkey, so what better day to have it than today?. Let’s get to the website, sintbernardus.be, and see what they have to say about this brew. 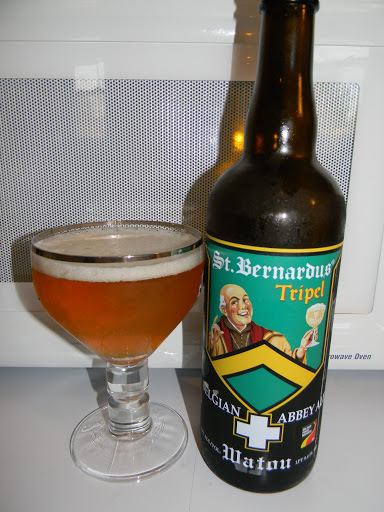 St.Bernardus Tripel is a traditional abbey ale brewed in the classic “Triple” style of Belgium’s best Abbey Ales. It has a blond to pale amber color with a wonderful head, slightly sweet aroma and the orangey-grassy flavors of hops in the finish. Wonderfully drinkable and surprisingly light. Let’s sip this bad boy. This brew comes in a 25.4 oz. bottle with an ABV of 8.0%. It poured a hazy, golden/yellow to golden/orange color. It formed a white cap that was decently sized, soapy and quite fizzy. The retention time was so-so, yet the lacing looked pretty good I thought. The nose released hints of grain and hay. Tones of lemongrass, lemon citrus and a bit of fruity pear as well. A nice component of Belgian yeast and a not particularly strong aroma of peppery spice. The malt smelled very sweet and enticing. Deep within the bouquet I even began to notice a fragrance of banana and clove. The taste let that peppery spice and Belgian yeast pop. It was way more prevalent than it was in the aroma. More of that sweet malt along with some grassy hops and savors of grain followed. The fruity pear and lemon citrus really helped tie it all together. Only a very minor touch of alcohol was detected. It had a very well balanced and pleasing flavor. Tasty. The mouthfeel was medium bodied. Dry, spritzy, bright, lively, crisp and bitey. It had an almost stinging carbonation, which I didn’t seem to mind too much considering. It provided a touch of warmth from the peppery spice and a very nice amount of flavor was left behind after each sip. Over the last couple of years or so I have really begun to love drinking Tripels and this beer is another one that I’m going to have to revert back to from time to time. It’s a very good beverage and definitely worth a try if you favor this style. I have no doubt that this brew would go great with a big, juicy Turkey and dressing. The drinkability was outstanding, however it could still be sipped slipped slowly to let those flavors develop. Not only that, but I think it could be enjoyed year round and not just the Holidays. So, the next time you see the St. Bernardus Tripel, pick it up and give it a go. I doubt that you will be disappointed. Have a great and happy Thanksgiving everyone and I’ll see you next time. Cheers. Hi guys. I have a very special brew to share with you for today’s craft beer review. It’s the St. Bernardus Abt 12 produced by the Brouwerij St. Bernardus NV located in Watou, Belgium. This beer really needs no introduction. It’s obviously well known in the craft beer world and I, unfortunately, have never had it….. and I can’t wait. The website, sintbernardus.be, has this description of the Abt 12. This beverage comes in a 25.4 oz. bottle and it has an ABV of 10.5%. The appearance of the Abt 12 was a cloudy, dark brown to burgundy color. The collar was tan, very creamy, smooth and soft. It consisted of small, tight, compact bubbles. The size was good, the retention time was gratifying and the lacing looked very nice. Once it settled it left a thin film on top for the remainder of the drink and a small trace of alcohol legs were noticed on the glass when tilted from side to side. The nose was spectacular. Tons of dark fruit. Raisins, plums, dates and figs. Spicy cloves, light caramel malts and delicate touches of chocolate and licorice. It had that all too familiar Belgian yeast strain intermingled with a compelling banana bread fragrance. Awesome. This aroma wasn’t quite as robust as some of the other Quads that I’ve had, however it was way more balanced and pertinent. Beautiful. The taste was…. world class. All of the proper dark fruits were accounted for. Raisins, plums, dates and figs, however I also obtained some dark grapes and black cherries. It had a slight red wine taste as I let the flavor wash over my tongue. Like the aroma, I found a very inviting characteristic of Belgian yeast and bananas. Some toasted biscuits and a slight sour dough jolt too. Some more of that caramel, chocolate and licorice was detected, although it remained quite relaxed throughout the experience I thought. Toward the end I even started to pick up on some nuttiness and a tad bit of alcohol. Overall, the taste was very rich, harmonized and very complex. There was so much going on here that I couldn’t even begin to describe everything. The mouthfeel was medium to full bodied. It was very smooth, soft, chewy, dry and creamy with a great amount of carbonation. A wonderful alcohol warmth was felt at the back of the throat and on down into the belly for the first few sips, but it quickly mellowed and became almost obsolete. More than enough flavor was left on the palate for me to savor between sips. Wow!!! This beer was great. It’s totally deserving of all the praise that it gets. I can definitely see why so many people rave over it. It was outstanding in all categories. It only got better and more complex with each and every gulp too. This brew was a pleasure to drink. Not to mention it was relatively easy to down also. I would love to be able to find a few more bottles of this. A couple to drink now and a couple to save for a later date. One things for sure…. 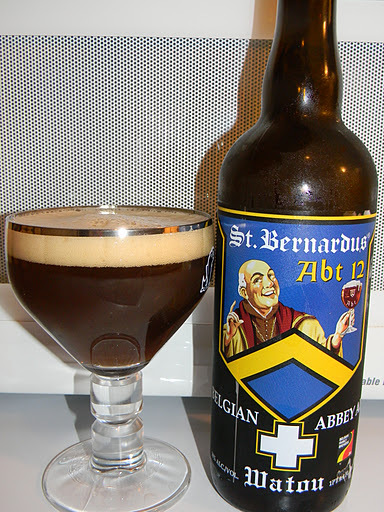 if you haven’t had the opportunity to try the St. Bernardus Abt 12. Do whatever it takes to seek one out and give it a test drive. I really doubt that you will be disappointed. As always, thanks for reading and commenting everyone. I really, really appreciate it.